Every year even though I have no new blog, it's always my hobby to join this writing project which recognizes the new blogs which emerge significantly in the world wide web. And yes, three of my major blogs were proud products of this writing project! This year, my excitement was tripled because I have my new blog which is this very own Runner Rocky. To be part of this writing project is Runner Rocky's advance birthday gift to this blog as it will celebrate its first year birthday this November. This Top 10 Emerging Influential Blogs 2015 Writing Project which is now on its 8TH Year seeks in identifying new and emerging blogs who are making an impact to its readers in 2014. These are blogs that started anytime from May 2014 to the present These blogs are gradually gaining a considerable amount of readership, following, influence and fascinating the reader in various ways. The bloggers behind them established the blog for various reasons such as expression of thoughts, sharing of knowledge and insight, building a movement, events reporting or coverage, and some for profit. In my case, this blog Runner Rocky was born to dedicate to my other hobby which is running and fitness routines. 1. Runner Rocky - Of course taking the No. 1 spot is my very own blog. I'm proud to say that this blog truly becomes influential because even though it is very new in the world wide web, it eventually got a growing number of followers not only from netizens but from runners and fitness enthusiasts as well! It combines two of my major hobbies which are blogging and running! You may check out more reasons why this blog is my top pick in my previous post: 7 Reasons Why Runner Rocky Should Be in the Top 10 Emerging Influential Blogs for 2015. 2. Take Off Philippines - This is the blog of my friend where he expresses his thoughts, ideas, creativity, and experiences. A blog with a major genre of food and travel. I love the food and places he shares in this blog because he always ensure that his post are more interesting and more captivating via his talent in graphic arts. And since he has a talent in graphic arts, his blog design continuously change and look fresh. 3. Manila Concert Junkies- I love music and I love entertainment! So definitely, this blog deserves to be in my top list! And did you know that I was first known to be an entertainment and celebrity blogger before being known as a runner-blogger?! Therefore, this blog is truly close to my heart. 4. Frugal Yet Fab - This is another inspiring blog. Yes, I really admire the owner/blogger of this website since she's a mommy yet at the same time, she is active in blogging and can find time in attending different events. What more, she is really a lucky blogger since she always win major prizes in most of the raffles and contests in the different events she had attended. I love her post "Buhay Contesera" because she showcased there all the lucky stuffs she received through blogging! This is a truly inspiring success blogger's story! 5. Pilipinas Daily - This is the blog that keeps you aware and updated of the latest happenings in the country from technology, fashion, food, entertainment, lifestyle, and health & wellness. I love the logo of this blog as it depicts the Philippine flag - very nationalistic. It clearly depicts that we should be aware first of the things happening in our country before the foreign trends. 6. The Ched Project - Fitness and lifestyle at the same time therefore this blog definitely deserves to be in my top list! I love the way how the blogger of this blog presented her fitness plan. I love reading her weekly fitness project dubbed as #ProjectFit plus the respectively week detailing diet and physical activities. 7. Our Travel Dates - "Traveling the World One Colour at a Time..." This is the motto of this blog which truly inspires me to travel and explore different places. The blog also features different events and hotel and food reviews which is truly helpful in adventure seekers like me. But most of all, what I love about this blog are the bloggers of this site who are real-life partners! How I wish someday, I can have my blog wherein the owners are me and my partner! So inspiring! 8. Chef Jay's Kitchen - A blogger and a food lover rolled into one! I love how the blogger of this food blog presents different restaurants, coffee shops, and food reviews. This blog helps me and my friend find the best food restos in town whenever we were looking for a place to eat or have a dinner out. 9. Health Frontiers and More - Since I'm into fitness and healthy living, this blog definitely part of my list! This blog let me aware of different healthy lifestyle from the food we take up to the physical fitness we do. I also like the blogger of this blog simply because she is a cool mom and an active blogger. 10. The Lost Diaries - With a motto of "See the world though my eyes; Live vicariously through me." this blog serves as an online diary since the blogger of this website expresses her thoughts and feelings online without bias. She even shares with her readers her different experience from food trip to fashion up to the different events she attended. And that completes my list of Top 10 Emerging Influential Blogs for this year. Now what's yours?! you may also join this writing project. 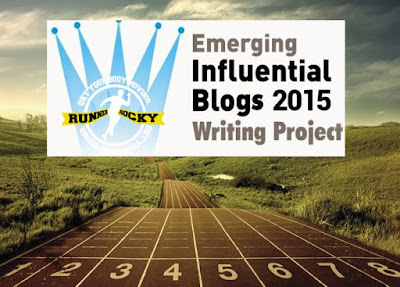 Kindly visit this for the complete mechanics: Join the Top 10 Emerging Influential Blogs 2015 Writing Project. Good luck and more power to these new blogs! Thank you rocky for a glowing nomination! Congratulations on being one of the top 10 as well! Also, I do want to clarify that I am not a chef by profession. I do love cooking and eating out a lot.